This is a forum for exchanging thoughts, opinions and funny experiences . This site also keeps you updated on news, politics, humor, sports including cricket and entertainment relating mainly to India-Our Home! Shahrukh Khan, the superstar of Bollywood. A huge success. And he buys a cricket team. Performance in the first IPL was so and so. But IPL-2 is super duper flop. 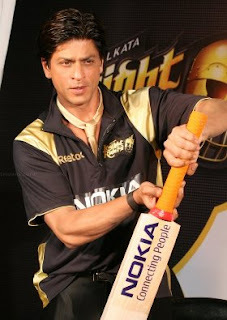 Kolkata Knight Riders have lost 7 of the 9 games played and is languishing at the bottom of the table. What went wrong? Well it was a leadership crisis. If you did not have faith in Saurav Ganguly you should have just dropped him or put him out of captaincy. But you tried to introduce the concept of multiple captains which meant you had no faith in anyone. Leader has to be one who can lead a team of 11 members and who can inspire them to perform above par. And you dared to criticize Gavaskar, the living legend of Indian cricket. A cricket team can be bought thanks to BCCI, but what is finally played in the field has to be and is cricket. That cricket you cannot buy and manipulate. Despite having terrific players KKR is crying hoarse for a leader. They are just not inspired. They are dropping simple catches regularly and are losing what they should have won. Just think of the fate of a ship out on a stormy sea managed by multiple captains! Assam Violence: The Dynamics of Continuity! Honest Cop Murdered By Mafia in India. Notification of Change of Site URL! Bhupen Hazarika and Mamoni Raisom Goswami Pass Away in November. The Neverending Cost Saga of A Leave Travel Concession!!! Stop Eve Teasing Sick Killers! Justice For Keenan and Reuben! Baby Falak, the bruised and brutalized 2-year-old girl, finally decided to say goodbye to this cruel world (India) and departed for a better world. The poor child died on her third cardiac arrest on Thursday (March 15, 2012) at the same Delhi hospital she was admitted to though she had been improving well over the past few days. Doctors attending for nearly two months were planning to discharge her soon, but they were not sure of her brain functioning. Prayers for the eternal bliss of her tiny little soul. Delhi police has meantime arrested 8 persons countrywide on a horrifying trial of human trafficking, domestic violence and child abuse. Darbari Politics: Do Not Go Overboard, Mr. Kejriwal! How to Define the Syndrome of Being Busy! Asia Cup Cricket: India Pulverize Pakistan, Enter Final of Unimoni Asia Cup! Kumartuli—The Workshop Of The God Makers In Kolkata! And Durga Puja! Indian Politics: More Cartoons Out Of The Cupboard! Facebook: What Activates Your ‘Deactivate’ Urge...! The Munching Ways Of A Miser...! Amulya Kumar Chakravarty was a writer and a celebrated translator of world epics. He translated Homer’s Odyssey and Iliad and Virgil’s Aenid into Assamese. These books were published in the seventies and eighties in Assam, India; and even now are bestsellers going into multiple editions. Doubled with a flowing original language and strict authenticity these translated epics are hailed in Assam as trend setting translations. 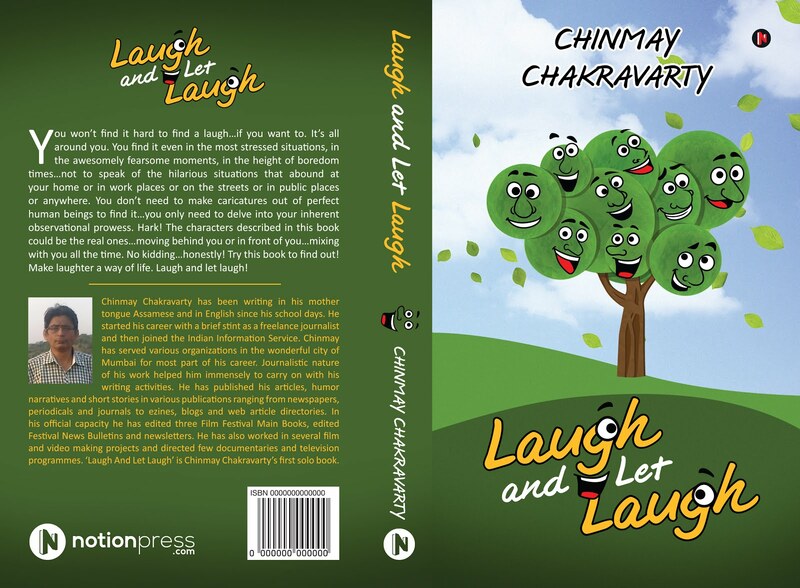 Amulya Kumar Chakravarty had a hard life. Being a farmer’s son he went to the nearby town for studies and after graduation set off for Calcutta (now Kolkata) for post graduation in English. His ambition was to become a college teacher so that he could devote his life to education and writings. But due to economic hardships he had to come back half way and was forced to join Assam Civil Service of which he could not ever come out. He also contracted diabetes after forty years of age. Uprightness, honesty and efficiency ruling his career he always struggled for economic stability. He never had enough money and always took pride in telling that his only investments in life had been on his four children's education. Burning a lot of midnight oil, literally, and waging a constant war against mosquitoes he continued his writing activities and apart from the three translated epics he also wrote numerous short stories and a half completed novel. His exemplary honesty remains a source of inspiration for his admirers in today's environment of rampant corruption. 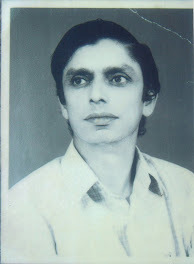 Amulya Kumar Chakravarty passed away in 1991. His family and local literary bodies in Guwahati formed a memorial Trust in 2002 and decided to institute an Award for excellent literary translations in Assamese on a biennial basis. The first Award consisting of cash prize and certificate was given in 2003 to one of the nominated books. This gave a tremendous boost to promote genuine translation works in Assam. The Trust has announced the Award for 2011 to eminent author Dr. Prafulla Kataky for his outstanding contribution to Assamese literary translation work. The Award was presented at an august function held on October 09, 2011 at Veterinary College Auditorium, Guwahati. For 2013 the Sixth Amulya Kumar Chakravarty Memorial Translation Literature Award was presented to Author-Translator Bipul Deuri at a dignified ceremony held on 6th October, the 22nd Death Anniversary of Amulya Kumar Chakravarty, at Sankardev Kalakshetra, Guwahati. 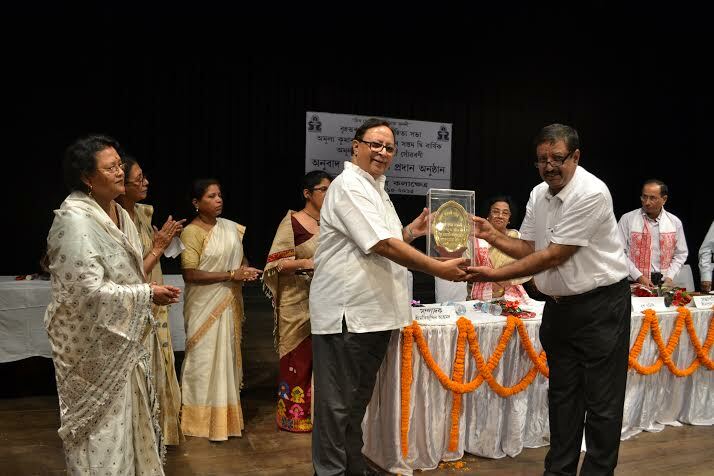 The Award was handed over by Imran Shah, President of Assam Sahitya Sabha. A Painting Competition for Children was organized by Shrutinaad earlier on the day as a part of the event. Translation Award-2011 Presented to Dr. Prafulla Kataky. Urmila Chakravarty, President of the Trust, Talking to Media. 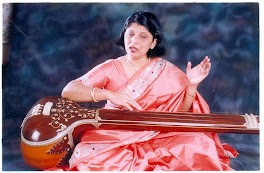 Ragini Chakravarty is a Hindustani Classical Vocalist of the famed Kirana gharana and a disciple of Padmabhushan Dr. Prabha Atre. Ragini has been performing all over India with her classical recitals, light compositions and sangeet se sangeet tak concerts. She can be consulted here for program details. 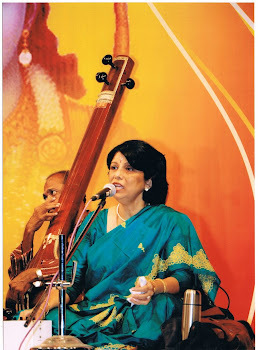 Under the banner of Shrutinaad Ragini also conducts regular classes on vocal music. Ragini's second audio album 'Bhoyai Oi...Kahani Ahiba Ghuri' (O' My Beloved...When Are You Coming Back Home!) was released at Guwahati on 4th January by renowned writer-author Lakshminandan Bora. This album consists of ten immortal Assamese songs of poet-composer-author-freedom fighter Kamalananda Bhattacharyya. Beauty of words and melody make these numbers irresistible. Hari Darshan Ki Pyaasi! 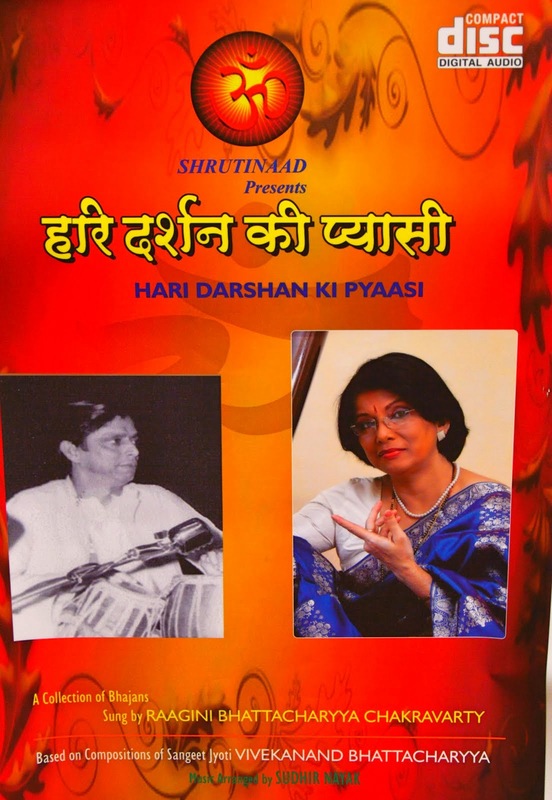 Hindi Bhajans. My Grandfather's Songs! Melodious Songs Bhoyai Oi....! Old Melodious Songs. 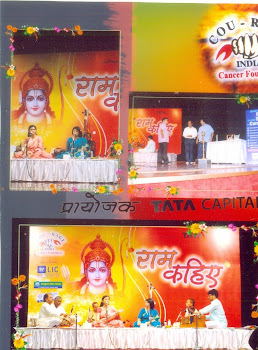 A Ram Navami Music Special, Nehru Centre, Mumbai, April 12, 2011. Ragini and Pranati. 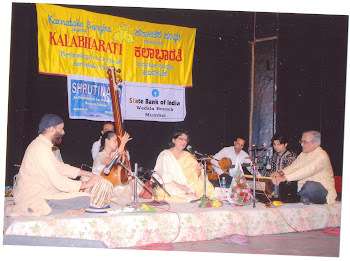 43rd Mahashivratri Bhavya Sangeet Samaroh, 2011. It was on this day of 4th January, 1951 that the State of Assam lost a great son , a poet, composer, lyricist, playwright and freedom fighter, Kamalananda Bhattacharyya who had composed over 200 songs in Assamese apart from a vast array of other writings. We offer our tributes to this great personality whose treasure-house of pristine music continues to inspire us and all music lovers of Assam. Tabla Maestro and Music Composer-Dirctor of Assam. 1930--2007. The North East India Resonates! 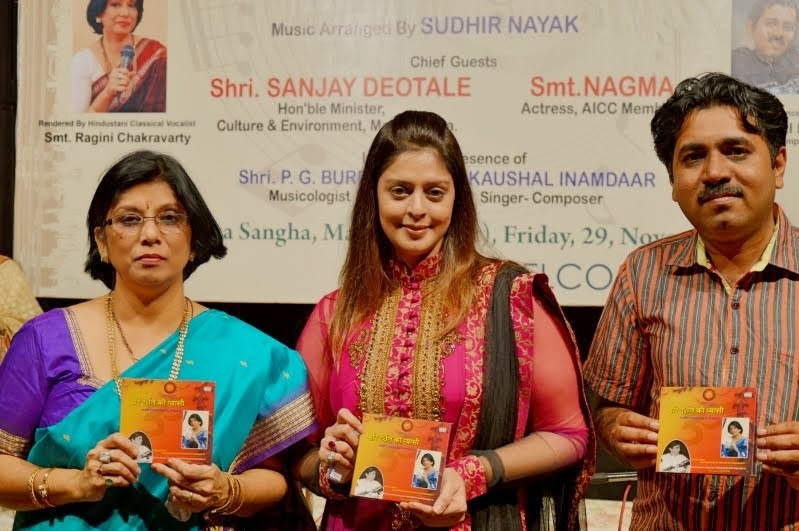 Ragini Chakravarty Gets Business Express Kala-Shree Puraskar For Music! Politics-Cricket: General Elections-2014, Political Violence and Asia Cup! Cricket T20: Pathan Stars As India Thump Sri Lanka! Assam: Load Shedding Of The Third Kind! Cricket India Vs Australia: India Seal Test Series 3-0, Create History! Love Marriage Or Arranged Marriage? Thank You! Come Again!. Picture Window theme. Powered by Blogger.